On the day of the Holy Pentecost (Trinity Day), when the Church commemorates the descent of the Holy Spirit upon the apostles, there also occurs an abundant outpouring of the Holy Spirit upon all of us who pray in church on that day. During the Vespers (which follow immediately after the Divine liturgy), the Church prays for “all those present, awaiting the grace of the Holy Spirit,” while the subsequent kneeling prayers speak of the actions performed by the grace of the Holy Spirit. And we, too, pray to the Holy Spirit to visit His grace upon us, to cleanse us of all impurity, and to grant us holiness and comfort, because He is the Source of both one and the other. 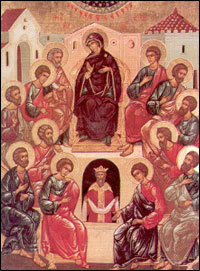 A certain elder said: on the day of the feast of the Holy Pentecost, when you will be kneeling, brother, and piously heeding the prayers offered by the priest on behalf of his congregation, then you should definitely know for what you should pray, for on that day the Holy Spirit is present in the Church so obviously, so fragrantly and divinely, that He will hear your prayers. Therefore, brother, concentrate your thoughts and think ahead of what you will ask of God. Perhaps there are many sorrows, and cares, and burdens weighing upon your heart, and you wish to ask God to resolve your problems and to help you. Pray for it. But your first, and primary, and infinitely more important entreaty should be that God grant you the grace of the Holy Spirit and fill your heart with it to a surfeit, i.e. that He receive you into the Heavenly Kingdom while you are still on earth, that He grant you the pledge of future eternal rapture. I will even tell you that that should actually be your only entreaty on that day. However, the flesh is weak, and in your frailty you may ask God for help with worldly cares, if you so desire. God will hear you, as it is written: “The Lord hear thee in the day of trouble” (Psalm 20:1). Always remember the words of our Lord Jesus Christ: “But seek ye first the kingdom of God, and His righteousness, and all these things (i.e. all your earthly needs) shall be added unto you” (Matt. 6:33). Incorporate these words both into your faith and into your life: believe in God and trust in God. Know also that God knows how much your heart suffers from earthly misfortunes, and that the small coal of love upon which flames and rises the incense of your prayer and faith may be completely extinguished if sorrows sap your spiritual energy. God knows that your heart is diminutive, and He wishes it to belong to Him entirely, as it is written: “My son, give Me thine heart” (Prov. 23:26). Thus, if you give Him your heart, God will make sure that it remains His and will not allow great sorrows and the demons, – who act under the cover of sorrows and who incite tempests in order to prize your heart away from God and with strong currents of misfortune extinguish your love for God and all your thoughts of eternal life. – to weaken your soul and bring it to the point of total exhaustion. Thus, brother, give your heart to God and afterwards remain without a care in the world, and be solely concerned with having your heart remain constantly in God’s hands. Thus, on the day of the Holy Pentecost, on the day of the commemoration of the descent of the Holy Spirit upon the apostles, earnestly pray that the Holy Spirit descend upon you, too, and prior to that prepare yourself with prayer and the reading of holy books. Thus, ask the Heavenly King to grant you this charity: the grace of the Holy Spirit. “Enter thou into the joy of thy Lord” (Matt. 25:21). Amen.